Tent stitch was a popular and easy to work embroidery stitch used extensively for creating richly decorated furnishings during the Elizabethan period in England. The first was made using tent stitch, silk thread and linen ground. The pattern was drawn on the ground and it was then embroidered using coloured silk threads. The whole of the linen ground was covered in stitching. This technique was used extensively for furnishings such as table carpets, cushions and bed valances. The second technique was the making of slips. In this technique a picture or image such as a flower or animal was drawn onto a linen ground and then worked with silk thread. It was then cut out and applied to a ground fabric, usually a luxurious and expensive fabric such as velvet or satin. A famous example of this type of work are the Oxburgh Hangings, partly worked by Mary, Queen of Scots. The Oxburgh Hangings were produced by making slips and applying these to a velvet ground. This stitch can be worked in several directions. It creates a strong, hardwearing surface, both on the front of the work and on the back. As such, it was often used for making cushions, bed valances and other items that would receive heavy, day to day usage. Stem stitch was often used in the pre-modern period as an outlining stitch. It could also be used as a filling stitch. To Work Stem Stitch - Work from left to right, taking regular small stitches along the line of the design. The thread always emerges on the left side of the previous stitch. This stitch is used for flower stems, outlines, etc. It can also be worked as a filling stitch if worked closely together within a shape until it is completely filled. A popular stitch, split stitch was used in many forms of embroidery including Opus Anglicanum and Heraldic Embroidery. It was used for very fine work, often only using a single strand of silk thread or was done using quite thick threads, such as wool. It was used as an outlining stitch or as a filling stitch. To Work Split Stitch - Bring the needle through at A and, following the line to be covered, take a small back stitch so that the needle comes up through the working thread, as shown in the diagram. Generally, it is easist to work this as a two step stitch by making a small stitch, then bringing the needle up through the thread at the half way point. To Work Chain Stitch - Bring the thread up at the top of the line and hold it down with the left thumb. Insert the needle where it last emerged and bring the point out a short distance away. Pull the thread through, keeping the working thread under the needle point. Bring the thread through on the stitch line and then take a small backward stitch through the fabric. Bring the needle through again a little in front of the first stitch, then take another stitch, inserting the needle at the point where it first came through. In blackwork, a single back stitch is usually worked over two threads on a single-thread evenweave. This stitch is used in both counted and free embroidery. To Work Surface Couching - Lay down the thread to be couched, and with another thread catch it down with small stitches worked over the top. 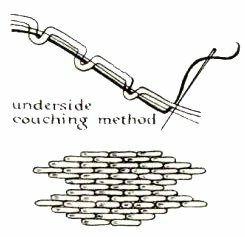 To Work Underside Couching - In the embroidery technique of underside couching, thread (usually gold) is laid on the surface of the ground fabric, couching threads are then passed over it. As each couching stitch is worked over the gold thread, the needle is carefully re-inserted into the hole in the backing fabric that the needle created on the way out. The couching thread is pulled tight and a tiny loop of the gold thread from the surface drops through the hole in the backing fabric to the underside (thus giving the technique its name). This creates a hinge in the gold thread, allowing the fabric to bend and giving it a great flexibility. Fabric worked with gold thread in underside couching has much more drape than fabric with surface couched gold, thus making it a much better technique for working objects which will be worn, such as ecclesiastical vestments. Laid and Couched Work, is a form of embroidery where a thread (usually wool ) is laid on a ground fabric (usually wool or linen ). This stitch is created by laying a set of ground threads, that work from one side of the pattern to the other (Fig a). Over these threads, in the opposite direction, are laid another set of threads at regular intervals (Fig b). These cross threads are then held down by a series of couching stitches (Fig c). The whole process results in an area completely covered in thread. This technique allows for large areas of pattern to be covered very quickly. To Work Herringbone Stitch - Commence by bringing the needle out on the left-hand side of the line to be worked. Make a small stitch on the upper line which points to the left. Keep the thread below the needle and pull it through the fabric. Insert the thread on the lower line a little to the right and make a small stitch which points to the left. Pull the needle through the fabric with the thread above the needle. Klosterstitch, a form of single thread couching is also known as Bokhara or Roumanian couching. It was widely used in 14th C German states, especially in works associated with convents, hence the name "kloster" or convent stitch. To Work Klosterstitch - Klosterstitch is worked with one thread and needle. A straight stitch is made across the ground material and the needle and thread re-emerge to stitch the long thread down on the return journey (see diagram). Small, slanting stitches are worked over the laid thread or yarn to hold it in place. In historical embroidery, detached buttonhole is most often seen in the floral designs found in Elizabethan embroidery, on coifs, jackets and occasionally sweetbags. How to Work Detached Buttonhole Stitch - Often worked over foundation threads, detached buttonhole stitch is worked on the surface - do not pierce the cloth or background stitching. First work a foundation framework, stem or chain stitch was often used. Then work a row of buttonhole stitches, over this framework. Increase or decrease the number of stitches to reflect the desired shape. Use the bottom of the first row of buttonhold stitches as the foundation for the second row. Continue until area is filled.